JSC Rescrutiny Result 2018. Junior School Certificate JSC Board Challenge Result 2019 will be released very soon. Now all education boards students can get JSC Re-scrutiny Result 2018 from this page. Here is the JSC Board/Khata Challenge Process with Application Fee. Are you looking for JSC Rescrutiny Process 2018 or JSC Board Challenge Process 2018? So you are entered in the right place. Because here we have discussed “Khata Challenge Process & Result”. Khata Challenge is another name of Re-Scrutiny or Board Challenge. Now it is time to share the full process about Re scrutiny Process & result getting process. Here you will learn, What are JSC Re-Scrutiny and its process and result getting process. JSC (Junior School Certificate) Re-Scrutiny. It is a Challenging fact! Some of the students take the challenge against their JSC Result. They think, My result will be better more than the current result. And some of the students want to make this challenge when they failed in any subject. So they want to Re-Check their result by taking Re-Scrutiny. Remember, it means not again exam papers marking. It is a process to check your total number. All question marks will count again. It is called Re-Scrutiny (Bengali: Board Challenge, পুনঃ পরীক্ষা) of Bangladesh Education Board. Now let’s check the JSC Rescrutiny Process 2018. JSC Rescrutiny Process 2018 has published officially. Re-Scrutiny program will start on 25th December 2018 after publishing JSC Result 2018 of all education board. And application will end on 2nd January 2018. Every candidate can apply for JSC Re-scrutiny or Board Challenge. But you need to know the correct process. If you don’t know about this, so don’t worry! Here is the simple and workable way for JSC Rescrutiny 2018. Only SMS System!! Now send the complete message to 16222. After sometime later you can get a reply message. Reply Message: You can get reply SMS from 16222 after sending the message. This SMS tell you, how many charges will be needed for the Rescrutiny and provide you a “PIN” number. If you want to complete the process, so you need to pay the bill by sending an SMS again. Send the SMS to 16222. Send the SMS to 16222. Every Subject or Part will be charge BDT 125 each. Every Subject or Part will be charge BDT 125 each. Now every candidate is waiting for JSC Rescrutiny Result publish date. Result publish date will be published very soon officially. You can able to Download JSC Board Challenge Result 2018 from our website after publishing the result. Are you looking for JSC Rescrutiny Result 2018 or JSC Board Challenge Result 2018? So you can able to download the result of all education board. All Education Board JSC Re-Scrutiny Result 2018 PDF available on our website. Anyone can download the result from the official website and also from our website. Every candidate is waiting for their JSC Rescrutiny Result 2018 after complete the JSC Rescrutiny Process 2018. Now everyone can download their JSC Board Challenge Result from the official website and also from our website EduandResult.com. 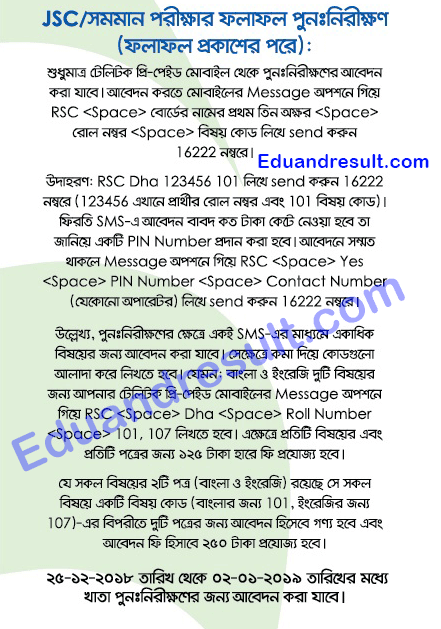 Here you can able to download all education board JSC Result 2018 BD Education Board. Here we have shared JSC Rescrutiny Process 2018 and JSC Board Challenge Result 2018. We hope you guys successfully understood and gain our article. If you have any confusion or question about this article, so feel free to contact us via the comment box below. Please try to share this article with your friend circle. Thank you so much for being with us.